The Attikos deme Erkhia was located near the modern Spata, approximately twenty kilometers (twelve miles) east of Athens, with the deme center located at Magoula. The deme of Erkhia is unique as we have recovered an elaborate sacrificial calendar--the Greater Demarkhia--listing sacrifices, costs and rules for the festivals held under the supervision of the demarch. The calendar prescribes 59 annual sacrifices to 46 separate divinities, including heroes, nymphs and Gods, and some of them seem unique to the deme. The Gods most frequently honored at Erkhia were Zeus, Apollon, Kourotrophos ('She who raises the young') and Athena. A few times a year, the men traveled to Athens to sacrifice to Zeus an Athena 'of the city', to Apollon Lykeios, and to Demeter of Eleusis. For worship at the deme, Erkhia had its own Akropolis, where the same Theoi were worshipped as on the Akropolis at Athens, as well as more obscure Gods, like Zeus Epopetes, the Heroines, the Herakleidai, the nymphs, and the Tritopateres, as well as local heroes like Leukaspis ('he of the white shield') and Epops. Two of these sacrifices are upcoming: the one to the Leukaspis on the 20th of Mounikhion and the sacrifice to the Tritopatores on the 21th of Mounikhion. This is an announcement for the PAT ritual for the sacrifice to Leukaspis. As he was a Sican of Sicily, and apparently non-Hellenic, it's quite unlikely he was the one worshipped at the deme of Erkhia. It was most likely another Leukaspis that was a local hero. What, exactly, the source of this Leukaspis' renown was has been lost to us. Leukaspis appears not to be so much a war hero in Erkhia but a, what Robertson describes as a 'functional hero'. In Hellenic warfare a hoplite presses on the enemy with his shield, so that a buffering wind may well be likened to a shield-bearing warrior. As such, Leukaspis might have been a power associated with winds and tied to the begetting of a good harvest. So we wrote the ritual in that sense and used the two Orphic Hymns that best fit, To Zephyros and To Notos. According to the Greater Demarkhia, the sacrifice to Leukaspis was a ram, along with a 'libation not of wine'. In modern times, a libation of milk, honey, and/or water will most certainly do. You can find the ritual for the PAT ritual to Leukaspis here and join the community page here. The sacrifice to Leukaspis will take place on April 26th at 10 am EDT. 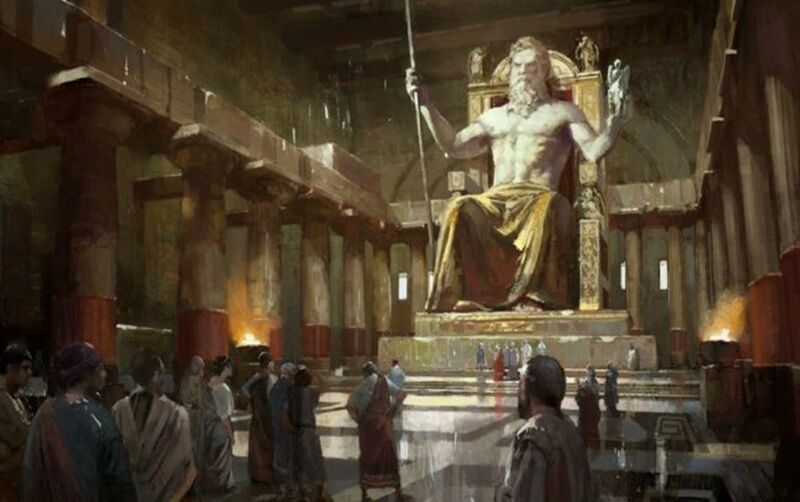 On April 25th, Elaion will host a PAT ritual for the Olympieia, in honor of Olympian Zeus. Will you join us at the usual 10 a.m. EDT? The temple project was revived from 174 BC to 164 BC, when King Antiochus IV Epiphanes, who presented himself as the earthly embodiment of Zeus, changed the design and put builders to work. The project halted again after his death. What followed was a period of disarray with looting, some minor attempts at restoration, and lots of neglect, until the project was finally completed in the second century AD, by Roman emperor Hadrian. In 267, the temple was badly damaged during the Herulian sack of the city, and very few--if any--attempt was made to restore it. By 425, the worship of the Hellenic and Roman Gods was banned by Christian emperor Theodosius II, and the temple was slowly dismantled for building materials. Even in its half finished state, Peisistratus and those who came after him, held a festival at the structure: the Olympieia, celebrated on the 19th of Mounikhion. For how long the festival was celebrated is unclear, but it died out somewhere during the reign of Hellas--most likely after the death of the Peisistratidae--before being brought back in the second century BC, as the temple was completed. 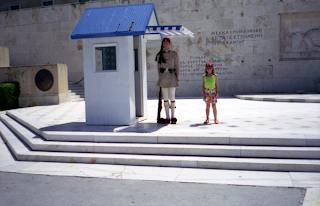 The festival was a military one and featured a procession and contests by the Athenian cavalry. Also attested are large scale sacrifices of bulls to Olympian Zeus. You will find the ritual for the event here and you can join the community page here. 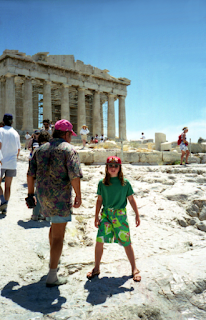 I recently wrote how I visited the Acropolis in Athens when I was tiny. Someone messaged me asking how tiny and why I was there. I was there on vacation and I was TINY! 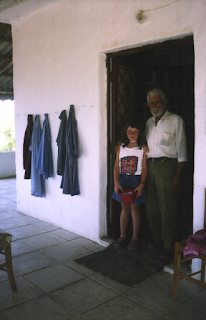 I visited the country in 1995 and 1998, when I was ten and thirteen, respectively. Here are some family snap shots of that trip for your enjoyment! I want to go back so badly. I was too small to really appreciate what I saw and experienced. I have incredibly fond memories of it all, and I saw so very much--most of which I still remember--but I would have such a different perspective these days. I would go for such different reasons and with so much more knowledge. It's impossible not to long for another chance to connect with the Theoi. 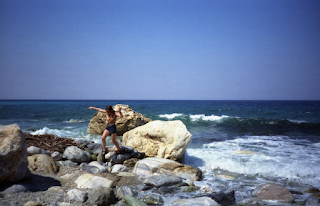 So, one day, I will go back and visit the country properly, as a Hellenist, visiting the country of my Gods. May Zeus grant clear skies as I fly. A team of divers from Sidon has discovered the remains of what appears to be 11 ancient Hellenic ships thought to date from the third century B.C., a statement released by the group Tuesday said. The team was led by Mohammad al-Sarji, head of the Lebanese Union of Professional Divers and director of the Sidon Diving Academy. The ships were "probably involved in the campaign of Alexander the Great, who tried to enter and occupy the city of Tyre in 322 B.C. by building a road extending from the beach to the city walls of the island," Sarji said, according to the Sidon Diving Academy statement. Professor of archaeology at the Lebanese University Jaafar Fadlallah, who has been conducting research on the site, told The Daily Star how remains from the over 2,000-year-old boats could tell academics more about the circumstances of their destruction. "The spread of broken pottery on the seafloor suggests that the goods were aboard a group of Greek ships on their way to the city of Tyre ... when a storm destroyed the boats and scattered their contents across the ocean floor. We know that the Greek ships traveled in groups of 11, and the quantity of pottery suggests this was a full group of ships." The main center of Tyre had been a heavily fortified island, forcing Alexander the Great to build a causeway allowing him to breach the fortifications after laying siege to the city for seven months. Sarji expressed belief that the ships would have transported the stones required to create the road. The ships may have sunk due to the weight of the load combined with high waves and strong winds, he said. "It is known that Alexander the Great besieged the island for several months, trying to storm it in many ways but without merit. In the end, he built a road from the mainland to the island which arrived on the [city’s] southeast side. He broke down the walls, entered and destroyed the city completely and took its inhabitants captive." Fadlallah said exploration work had been underway on the site for three months but the excavation and documentation of items would take much longer. "On land you can work whenever you want. But underwater, you can only work for periods of two hours at a time, so this work will take a long time." Sarji called on the Directorate General of Antiquities to begin work excavating the site and documenting the finds. I don't frequent Patheos, so I'm always grateful when someone points me to an article on there that is a must-read. 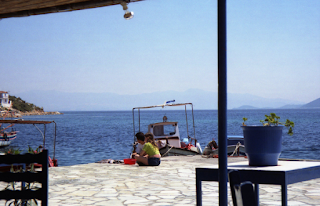 Angelo Nasios recently wrote about "The heart of Hellenism," and it's a beautiful piece that reflects everything Elaion is about. I'll post the introduction here. Go read the rest over at Patheos, please. "Are you waiting for an invitation to worship a God? If so, please stop – go worship! I say this because I have noticed that many pagans have a tendency to wait for the “call” to worship or, as many say, to “work with a God.” Some avoid certain Gods out of a notion that there is no connection between them and a particular God. I read one time how someone said they could not pray to Athena since they were ‘dedicated’ to another God. All of this is deeply problematic and within Hellenism could be understood as un-Hellenic behavior." 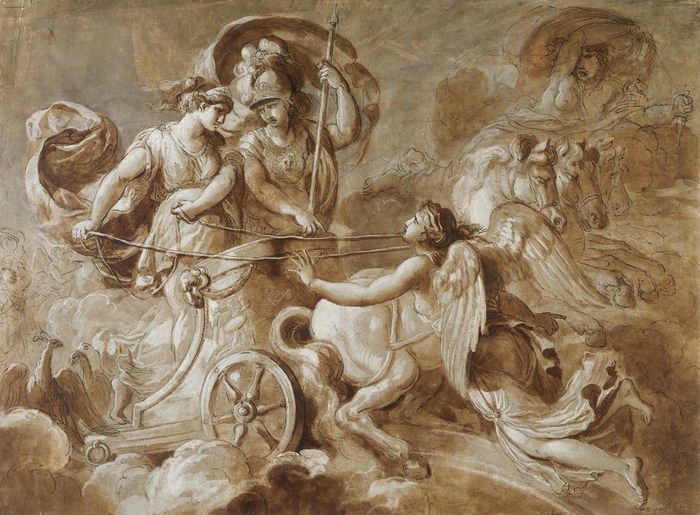 Hera, Athena, and Iris in the Trojan War, attributed to Jacques Reattu. Image via Wikimedia. The Mounikhia (Μουνιχιας), the festival after which the month was named, is celebrated on the sixteenth of Mounichion. 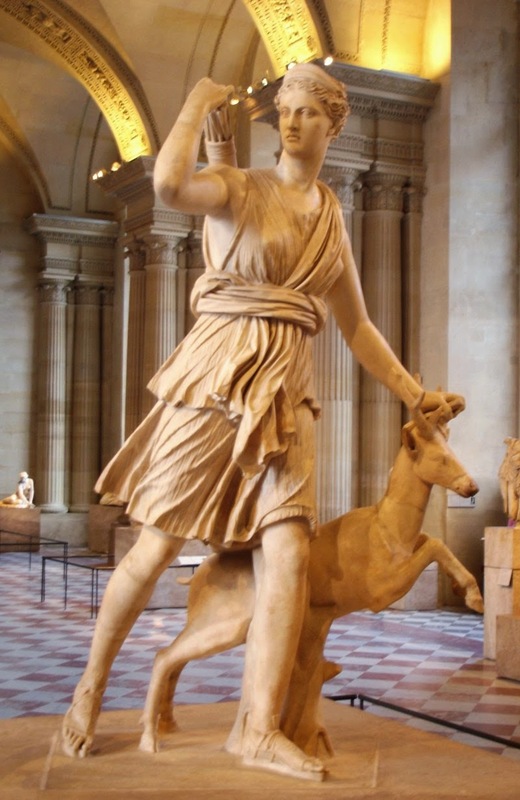 On this day of the full moon, Artemis Mounikhia (Αρτεμις Μουνυχια) was honored at the hill of Munikhia, for granting the Hellenes victory in the Battle of Salamis (Ναυμαχία τῆς Σαλαμῖνος). During the festival, young girls walked in procession to the temple on top of the hill carrying green boughs, while the rest of the celebrants followed, carrying special cakes called 'amphiphontes' ('shining all round’). These round white cakes were adorned with dadia (little torches)--lit candle--and were supposed to represent the full moon. A she-goat is also attested as a sacrifice. During this festival, an amphiphon was sacrificed to Artemis. It was a cheese pie on which candles were lit. Most likely, the amphiphon was a type of popanon; this is a large, round, flat cake with one or more, upright, protruding, knobs made from flour and cheese. The flat version of the cake, the popanon kathemenon was offered to Artemis, amongst others, as well as one with twelve knobs. We've seen this before for the Delphinia. If you want to learn more about the festival and its history, please read this blog post. To honour Artemis on this day, Elaion is organizing a PAT ritual. Will you be celebrating the Mounikhia with us? There will be two times: just after your dusk on April 20th, or at our regular 10 a.m. EDT on April 21st. As always, we hope you will join us at your oikos to honour Artemis, our eternal protector. You can join the community page here and find the ritual here. Parthenon Sculptured news. Yay, my favorite! Drawing on data gleaned from 19th century Ottoman archives, Acropolis Museum director Dimitrios Pandermalis has challenged claims by the British Museum that Lord Elgin had obtained permission from the sultan when Greece was under Turkish rule to transfer the Parthenon Marbles from Athens to London. In an address Monday to an international workshop titled "Reunification of the Parthenon Sculptures" co-organized by the Greek Presidency, the Culture Ministry, the International Association for the Reunification of the Parthenon Sculptures and the Acropolis Museum, Pandermalis said that an examination of the Ottoman archives between 1800 and 1830 by two Turkish experts revealed that Elgin was only granted permission to dig around the Acropolis. 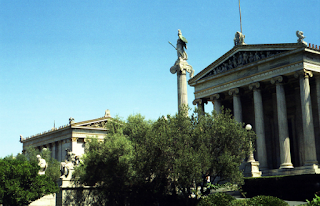 "There was no firman – meaning a sultan’s decree – for the removal and transfer of the sculptures by Lord Elgin. The document that has been saved and called a firman, and which was cited by Lord Elgin, briefly an ambassador for his country to the High Porte, is, in reality, not an order by Sultan Selim III." It was rather, he said, “an administrative letter” sent to Ottoman authorities in Athens which granted permission to dig into the earth mounds that were created around the Acropolis after it was bombed by cannon fire in 1687 by Venetian general Francesco Morosini. There was no permit for excavation or for a removal of the Parthenon Marbles]. The British Museum has long claimed that it acquired the Parthenon Marbles legally and that Lord Elgin had received permission from the Ottoman authorities which ruled Greece at the time to take them to Britain. 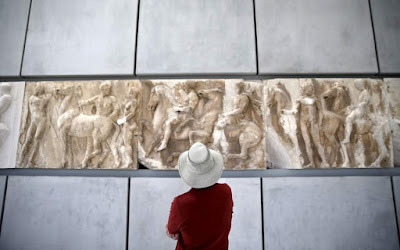 Meanwhile, Greek President Prokopis Pavlopoulos, who also addressed the workshop in the auditorium of the Acropolis Museum, likened the British Museum to a "murky prison" that has detained the Parthenon Marbles "as spoils of the theft" orchestrated by Lord Elgin. 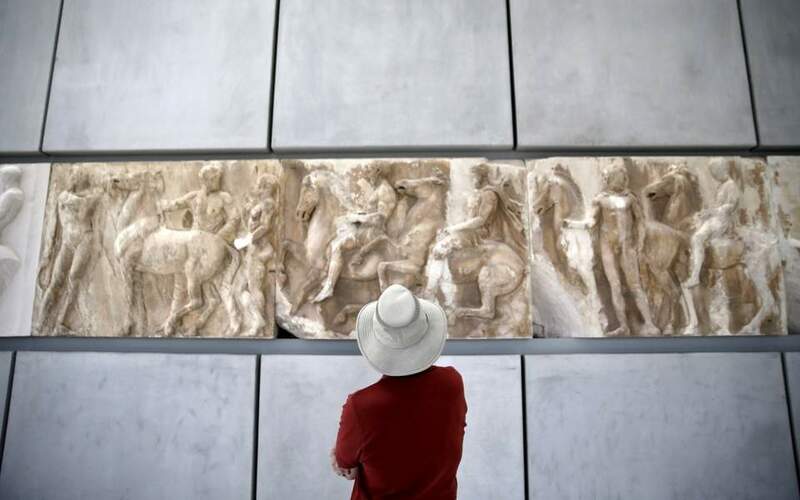 He said that since opening 10 years ago, the Acropolis Museum has undone the argument put forth by the British Museum that Greece did have not a proper place to display the marbles. "Let the British Museum come here and make the comparison between this (Acropolis) museum of light and the murky, if I may say, prison of the British Museum where the Parthenon Marbles are held as trophies."